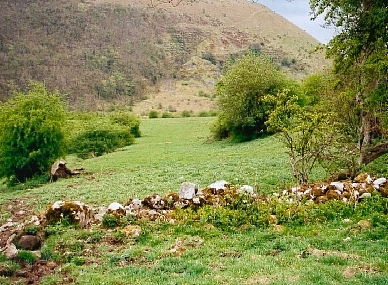 "Sanders and his lot would shoot you out of hand..."
Fleeing with his relentless pursuers on his tail, Charles jumps a dry-stone wall and falls from his horse. 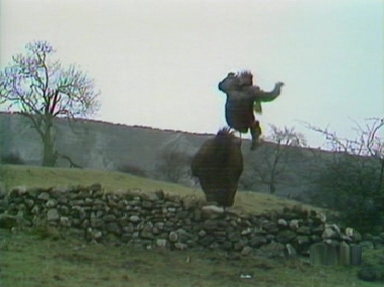 As the riders close in, he drags himself to the safety of the wall, and hides as they jump over him in turn. As they race away in pursuit of his horse, Charles crawls away — to find the railway line and steam train. Description: This horse chase takes place on a hillside just above the Monsal Viaduct, in an area parallel to the valley floor. 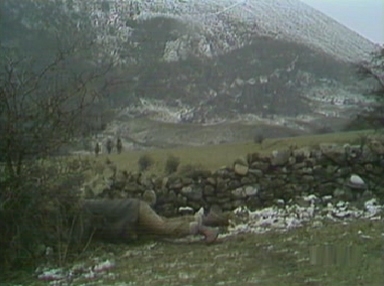 The shot of Charles falling from his horse is taken looking up towards the Monsal Head end of the valley (with the distinctive rocky outcrop seen moments earlier just visible at the rear of the picture). The shot of his pursuers approach and jumping the wall is taken looking down into the valley (in the direction of the weir). Where is it? : To reach this hillside, first find the intersection of footpaths and gates on the far side of the viaduct — at the opposite end to the tunnel mouth. 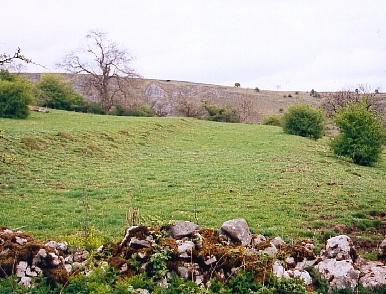 This point can be reached in several ways: by taking the footpath from the top of Monsal Head and crossing the viaduct; by climbing up one of the steep footpaths to the far side of the viaduct from the valley floor; or by approaching the viaduct from the opposite end of the valley, along the Monsal Trail and past the site of the old railway station. At this footpath junction, take the only path leading sharply uphill (on the left, when facing away from the tunnel entrance). Climb the path until it opens out into fields; and then walk slightly downhill, further into the valley. What's the best vantage point? : Identify the — much neglected — drystone wall, and the camera positions for the sequence become immediately clear. What about access? : This area is fully accessible to the public, although there is a short steep climb from the viaduct top to reach it. Anything else? : The sequence of Charles and Fenton en route to Fenton's halfway house in the snow storm was filmed on the same hillside, although taking a very different vantage point. It seems certain that the two sequences will have been filmed one after another. This location was confirmed by fans during the Mad Dog 2003 trip, on April 26.